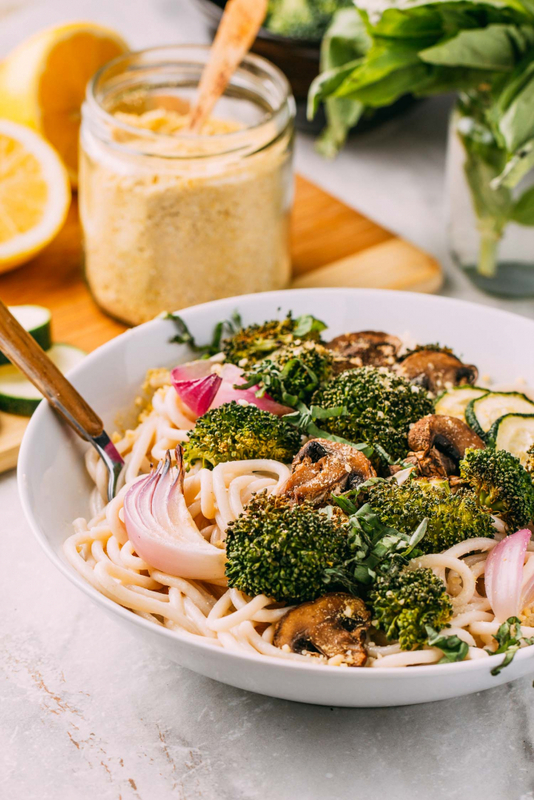 5-Minute Lemon Basil Alfredo Sauce, Pasta & Roasted Vegetables gives you about three cups or so of, absolutely fabulous, “alfredo” sauce without using a drop of dairy or refined oil! And if that isn’t wild enough, beyond our highest expectations, this whole food plant-based, oil-free, gluten-free, sauce is incredibly CREAMY! 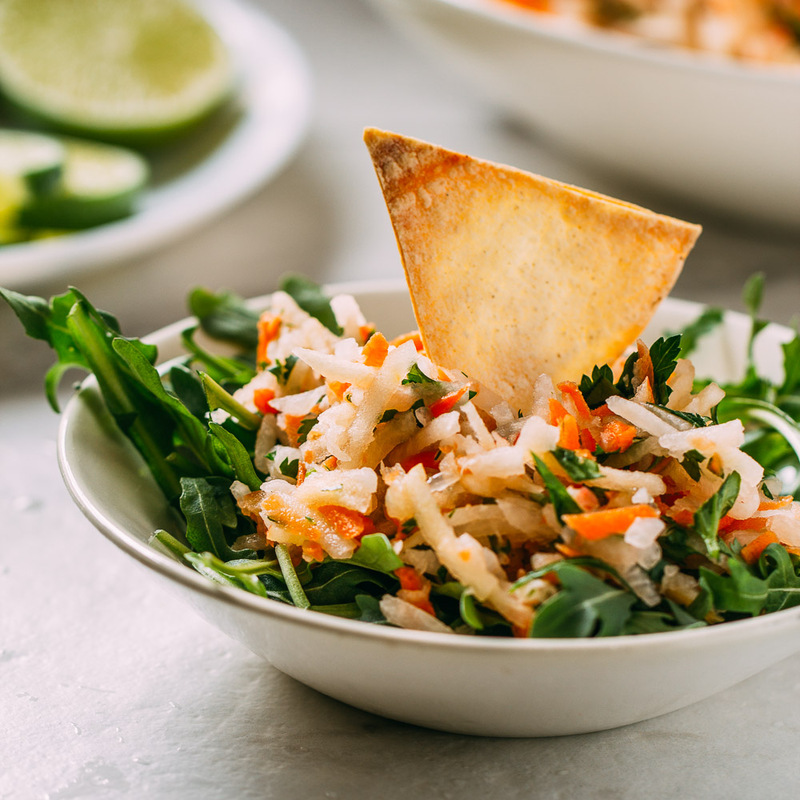 And do check out the nutrients listed on the bottom of this recipe, so you’re sure to appreciate the goodness the tasty plants bring to this wonderfully easy to prepare entree. Ever wish you could taste what you’re viewing on your screen? If there were a way, one bite would be all it takes. We think you’d enjoy the experience so much that you’d head to your kitchen to start cooking. Ah, if only we could share a bite! Sometimes when we share a recipe, we suggest optional herbs so that you can pick and choose and make the dish your own. But this time we must insist that you use the basil. Buy the basil, grown the basil, or even swipe it from your friendliest neighbor’s garden. But whatever you do, do not skip topping this delightful dish with ribbons of fresh basil. And please, if you can help it, do not use dry herb flakes that have been in your cabinet for a decade. 5-Minute Lemon Basil Alfredo Sauce, Pasta & Roasted Vegetables needs to taste fabulously fresh and basil-y. None of us “have” time to cook, but like everything else that matters, we must “make” time to be thoughtful about what fuels us. So, the best news ever is that our 5-Minute Lemon Basil Alfredo Sauce, Pasta & Roasted Vegetables is a time-saver at every turn! While the veggies roast, the pasta cooks and you blend the no-cook sauce, all at once. So really, and easily within around 30 minutes, you can put a delicious homemade whole food plant-based oil-free vegan and gluten-free dinner on the table. One of the optional ingredients we strongly suggest enjoying with this dish is either of our two parm-like toppings. Make these toppings ahead, and then keep in the fridge for a long while! Both come in so handy to finish off, soups, sandwiches, and all kinds of pasta dishes. You name it; it will taste even better topped with these two! Our wonderfully simple dairy-free Cashew Parmesan Cheese Topping is what we used in the photos with this recipe. But next time we make this we’re going to try our classic Plant-Based Pine Nut Parmesan. When you try this recipe share a kind word by leaving a comment. Or if you have a question or if anything is unclear, by all means, ask. It’s helpful to other readers when you comment and ask questions. Who knows? 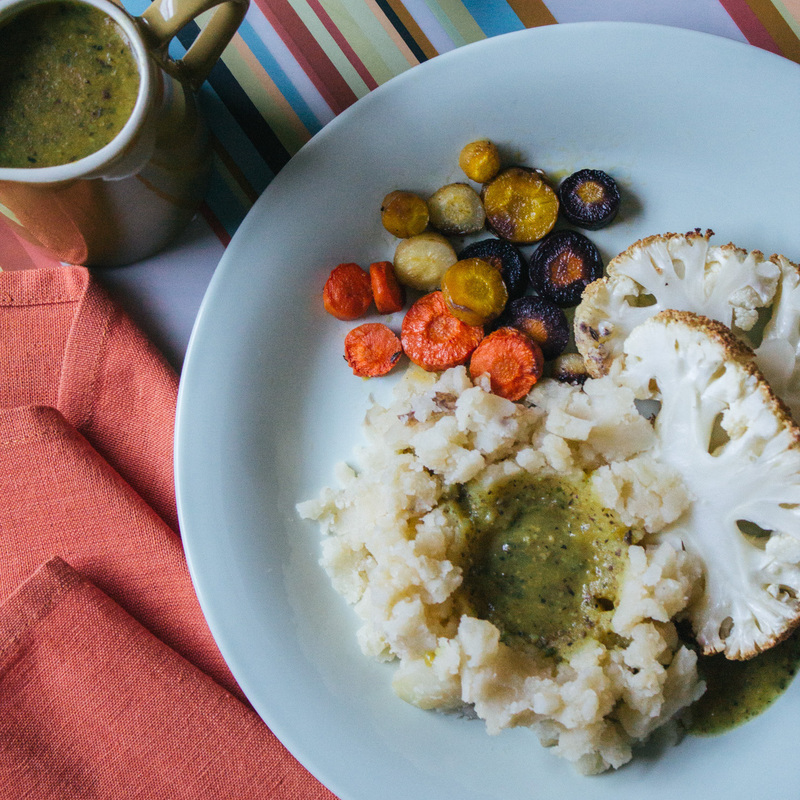 Maybe something you mention, ask or suggest may incline someone to try a plant-based recipe for the very first time. Wouldn’t that be fantastic? And thank you for reading and sharing this recipe. Pinterest is a fantastic place to save and share your favorite recipes, and we invite you to join us in the collecting fun we’ve got going on there. 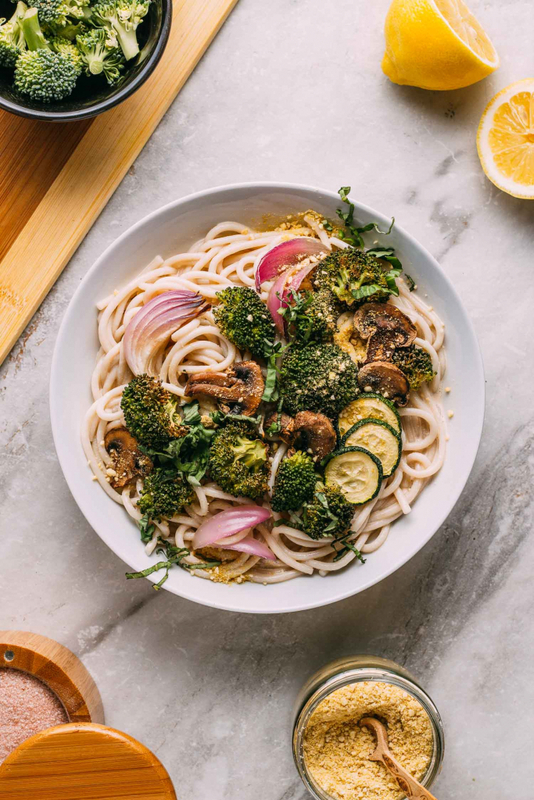 This dish is kick-booty-good with its raw sauce and roasted veggies, fresh basil and satisfying pasta – oh, my! And this generously flavor-filled entree recipe gives you about three cups of, absolutely fabulous, 5-Minute “alfredo” sauce without using a drop of dairy or refined oil! And if that’s not wild enough, beyond our highest expectations, this whole food plant-based, oil-free, gluten-free, sauce is CREAMY! 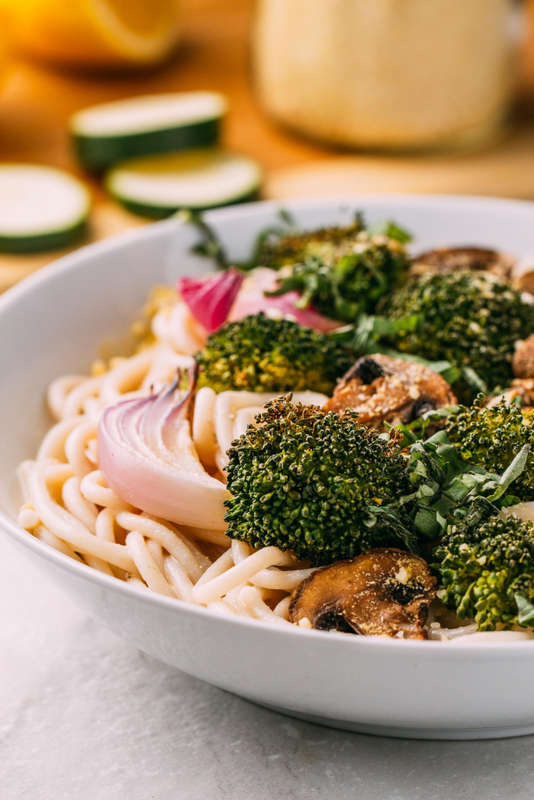 In this recipe, we use the no-cook Alfredo sauce with gluten-free pasta and roasted veggies topped with fresh basil. But we have plans to use this sauce in more ways, too, like maybe drizzled on top of baked potatoes or even just a whole bowl of raw veggies. Be watching for those recipe ideas! 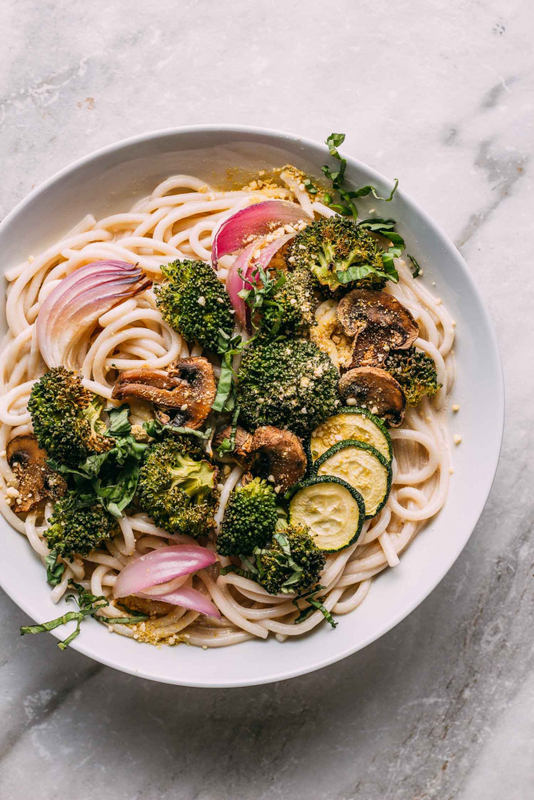 And when you make this dish, be sure to top all of that goodness off with a dusting of our wonderfully simple, dairy-free, Cashew Parmesan Cheese Topping. And then maybe the next time you make it, try it with some Pine Nut Parm! one head of broccoli cut into bite-size florets - We used about a pound of florets. 1 lb of spaghetti-style pasta - We like Tinkyada Brown Rice Pasta, Spaghetti Style because it's gluten-free. one cup of fresh basil, sliced into ribbons - Remember, the flavor of fresh basil is significant in this dish! about 2 cups of unsweetened cashew milk, lite coconut milk, macadamia milk or another unsweetened creamier variety of plant-based milk - See note below. 3 tsp of miso - We like this organic brand of miso. 1 tsp sriracha - We like to use this organic, gluten-free variety or Sriracha. 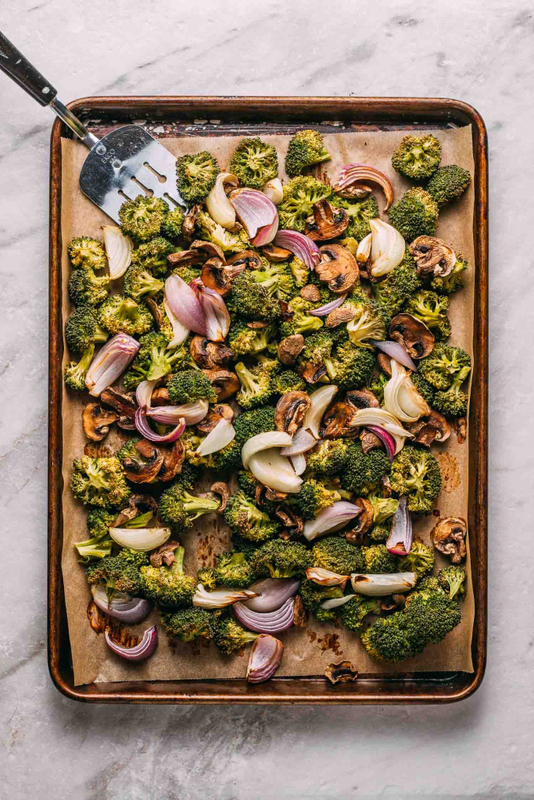 Begin by preheating the oven to 425º Fahrenheit and preparing one or two sheet pans for nonstick oil-free roasting by covering in parchment paper or by using a silicon mat. Next, get the veggies washed, sliced as suggested above and onto the prepared pans (or pans) for roasting. Splash a few quirts of Braggs Liquid Aminos for flavor. Don't overdo. A few teaspoons worth will add tons of flavor. Toss the veggies around a bit if you think the squirt of Braggs needs to distributing a bit more evenly. 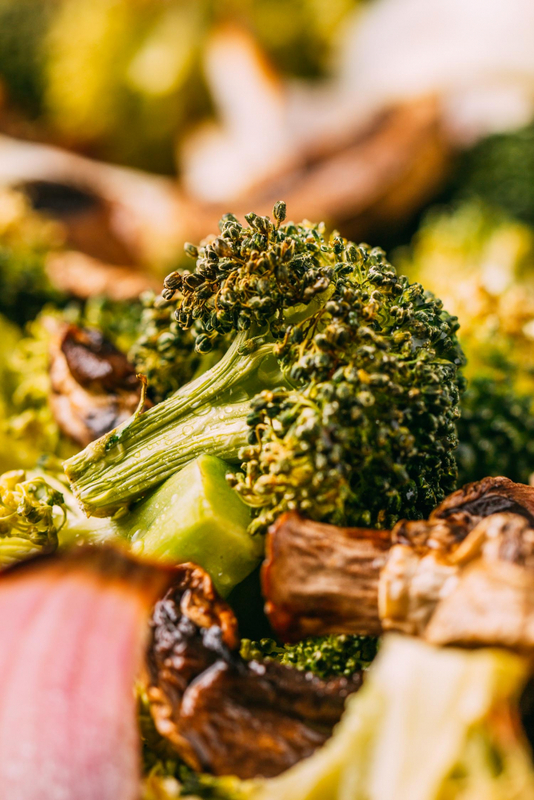 Roast the vegetables for about 20 or so minutes or until the veggies reach your desired level of doneness. While the veggies roast, cook your pasta according to package instructions for al dente. And as the pasta and veggies do their thing, in a high-speed blender, combine the No-Cook 5-Minute sauce ingredients and blend until creamy. Taste and adjust the seasonings as preferred. In a large mixing bowl or in the pan used to cook the pasta, toss the drained and cooked pasta with your raw alfredo sauce. 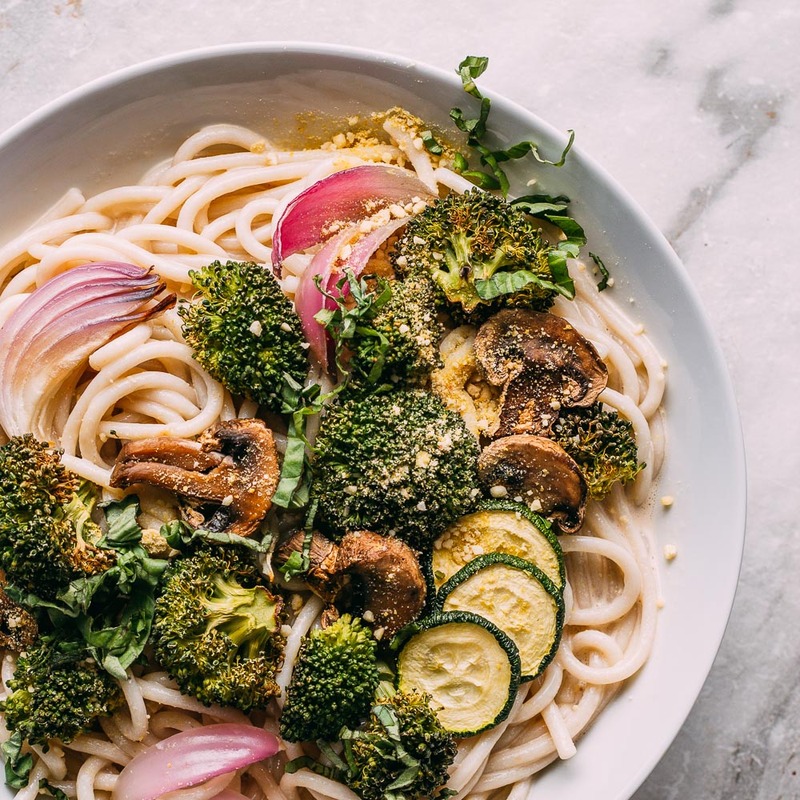 Plate the pasta and top with roasted veggies, fresh ribbons of basil and an optional sprinkle of classic cashew parm or pine nut parm. Did you know that you can soak a quarter cup of raw cashews in a bowl of warmish to hot water for about fifteen to thirty minutes to make cashew milk? Just drain and blend the soaked cashews with one cup of fresh water and, BAM, you'll have cashew milk! For this recipe, you would use 1/2 cup of soaked raw cashews blended with 2 cups of clean water to end up with 2 cups of milk as suggested for this dish. The nutritional info below does not include the optional cashew or pine nut toppings we suggest using with this recipe. The nutritional information for those toppings is on those individual posts.